These are awesome! Which one is your favorite? Kids these days, am I right? 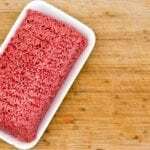 In a world where children regularly play with iPhones and iPads, it may come as a surprise that they still enjoy running around outside. But it’s true! Some kids still dream of having an epic playhouse of their very own. 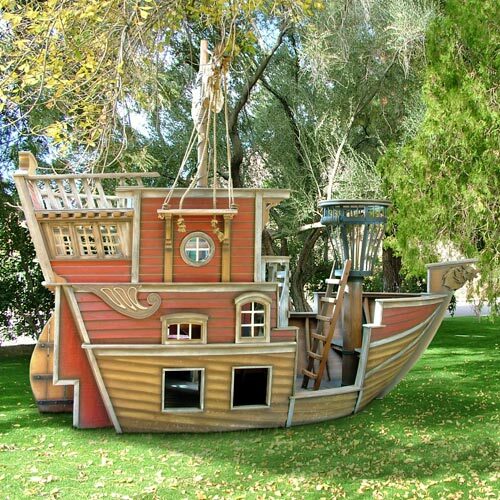 From pirate ships to seaside villas, here’s a roundup of 12 out-of-this-world playhouses, which includes a few more moderately-priced ones. Just a heads up, I’m a grown woman yet still kind of wish I had one of these to call my own. This incredible playhouse is the ultimate kid’s dream. 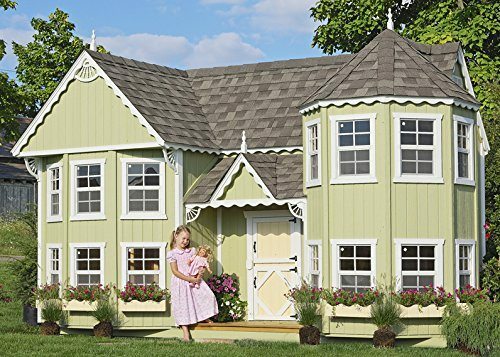 Essentially a mini Victorian home, this outrageous playhouse is decked out with working windows with screens, two lofts, gorgeous Victorian and gingerbread house trim details, a shingled roof and flower boxes. 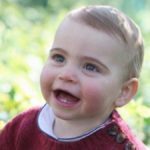 I wouldn’t be surprised if your kids never wanted to leave. This idyllic playhouse will cost you $6,399. Ahoy maties! Kids with wild imaginations, or simply a love for the pirate’s life, will lose their minds over this extravagant playhouse. This handcrafted pirate’s vessel is constructed of mahogany and Douglas fir wood and features 17 windows and peepholes, a cannonball-riddled mast and rigging, a carved wolf figurehead and an ornate helm and rudder. Basically a playhouse for any age, this ship also offers a captain’s quarters large enough for up to four adults, and leatherette-cushioned benches that can be transformed into sleeping bunk. Coming in at $52k, this playhouse is one of the most pricey on the internet. Did your kids love the “Lord of the Rings” movies? Then they’ll flip their lids when you give them their very own luxury hobbit hole playhouse. 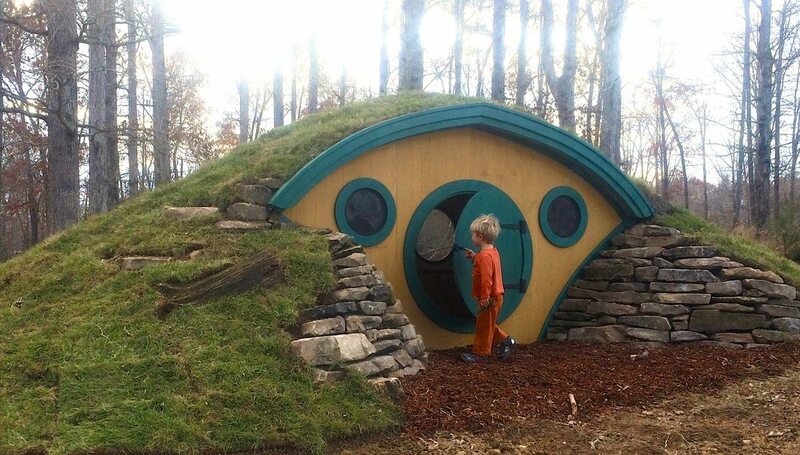 This hobbit hole is sure to transform your backyard landscape from lame to the talk of the town. Hobbit holes range in price from $1,695 to $7,995. These playhouses look as chic as any regular-sized house ever could. Check out the two-story Kyoto Maxi. With two levels and ample space, this Japanese-inspired structure will give your kids room to run wild with their imaginations. It’s bright, sleek and features 16 windows. Prices start at $11,500. 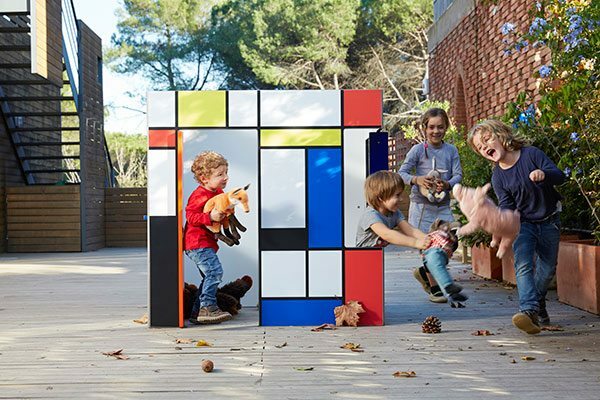 For another innovative take on the playhouse, take a look at this modern playhouse inspired by the De Stijl Art Movement of the twentieth century. It features bright colors, multiple entries and countless windows. It’s guaranteed to be a standout in anyone’s backyard. 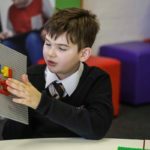 For kids interested in art and who thrive in creative environments, this is an unbeatable option.  Click here for information on pricing. Treehouses never fail to impress. 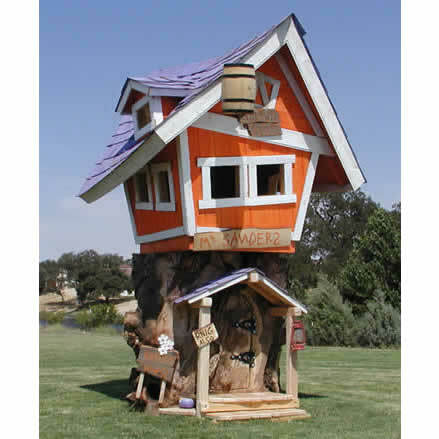 This creative tree house/ playhouse comes with its own “tree” (a six-foot tree stump) and a clubhouse. To add to the fun, it also features tilted windows, a bent roof and a selection of color schemes. 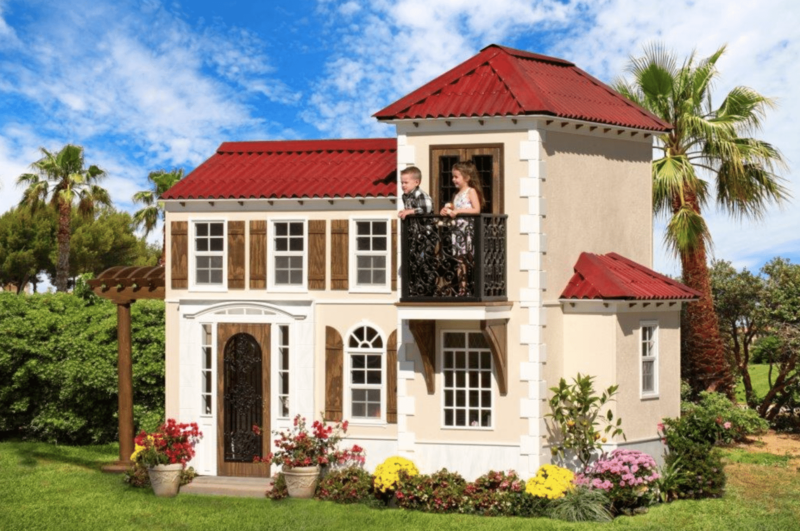 The playhouse comes standard with a swing, mini porch and trap door, but you can also add a rock climbing wall, monkey bars and a climbing net. Though the Timberland Tree House Deluxe isn’t cheap ($10,720), it’s versatile and comes with lots of options for customization. This Amish-made playhouse is absolutely adorable. With a covered porch, a chimney and a loft with a ladder, this quaint cottage is spacious, giving kids a true feeling of being out in the countryside. The added touches of shutters and flower boxes also make for a super homey feel, making it ideal for, say, a tea party on the deck? It comes with both an adult-sized dutch door, as well as one for the kids. The starting price is $3,274. 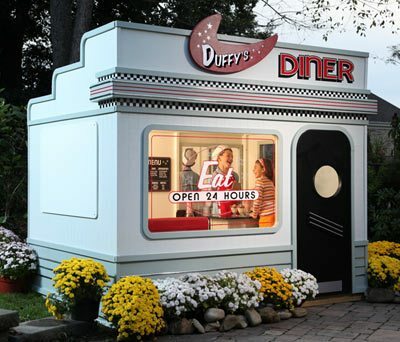 For an innovative take on the modern playhouse, look no further than Duffy’s Diner. This structure is decorated in a retro ’50s style, complete with black-and-white tile flooring, checkerboard detailing and a miniature booth for ordering. It even has a drive-through window! 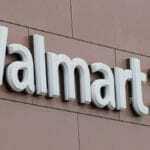 While it costs a whopping $8,499, you may want to spring for additional options like swings, slides, tunnels and more. There’s even an option for a drive-in movie theater exterior! 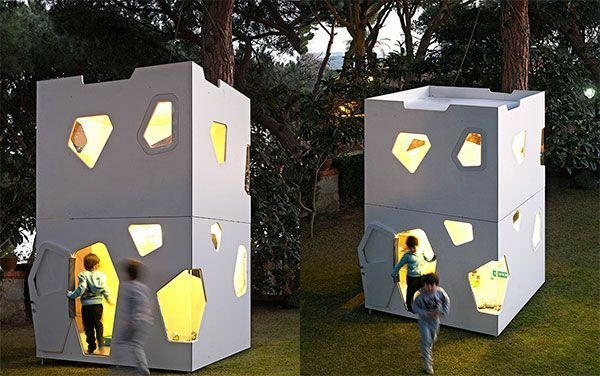 Casa de Caramel is the ultimate luxury playhouse. This posh structure is Mediterranean-influenced and is even constructed with orange tiled roofing and intricate carpentry to imitate a seaside villa! Not only are there lots of windows, a side porch and a second-floor loft, but there’s even a set of “double doors to the second-floor balcony to watch the pale sun set behind the seemingly endless ocean surf,” says the website. 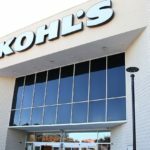 Though the price is a steep $15,200, it comes with features such as textured interior painting, a doorbell, ornamental railing, a pergola and even a fireplace mantle! When can I move in? The Discovery Skyfort II is no joke. 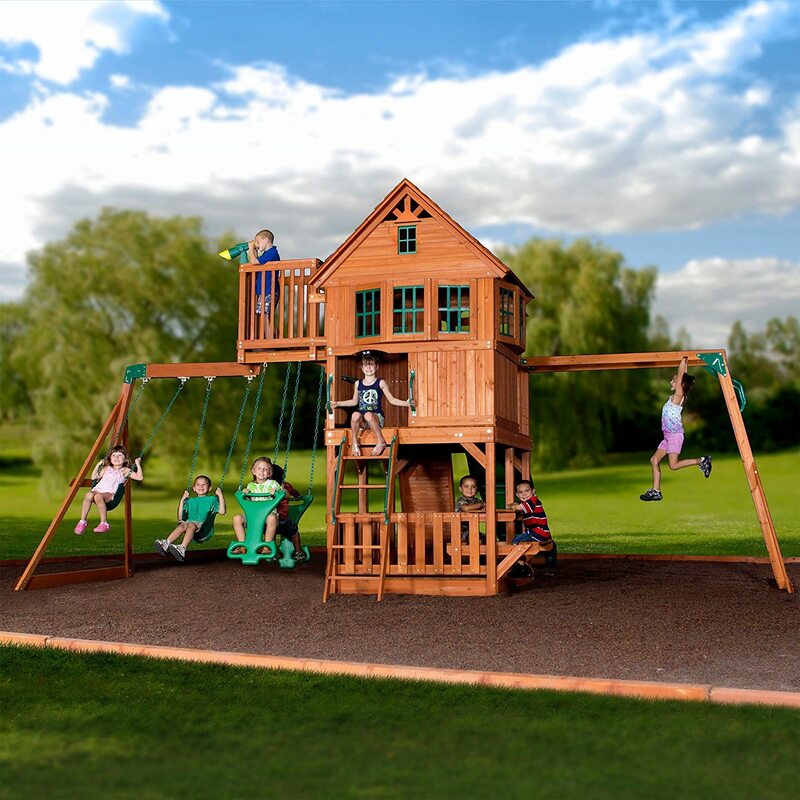 This playhouse has endless features, including a clubhouse, a lower play deck, monkey bars, a swing glider, a slide and a sandbox. Part fort, part playground any kid would be thrilled to call this their own. The clubhouse also comes with a porch, bay windows and a sun balcony. How cool is that? Made with 100 percent cedar, this playhouse costs around $1,750, making it a relatively moderately-priced structure for what you get. This cartoonish playhouse is easy to assemble and reasonably priced, making it a smart purchase for those not ready to drop thousands of dollars in the name of playtime. Kids can slide in and out of this cute, colorful playhouse that comes with a chimney and look-out windows. With its funky shape and compact size, it’s a solid choice for any smaller-sized backyard. This fun, affordable option is $514.99. 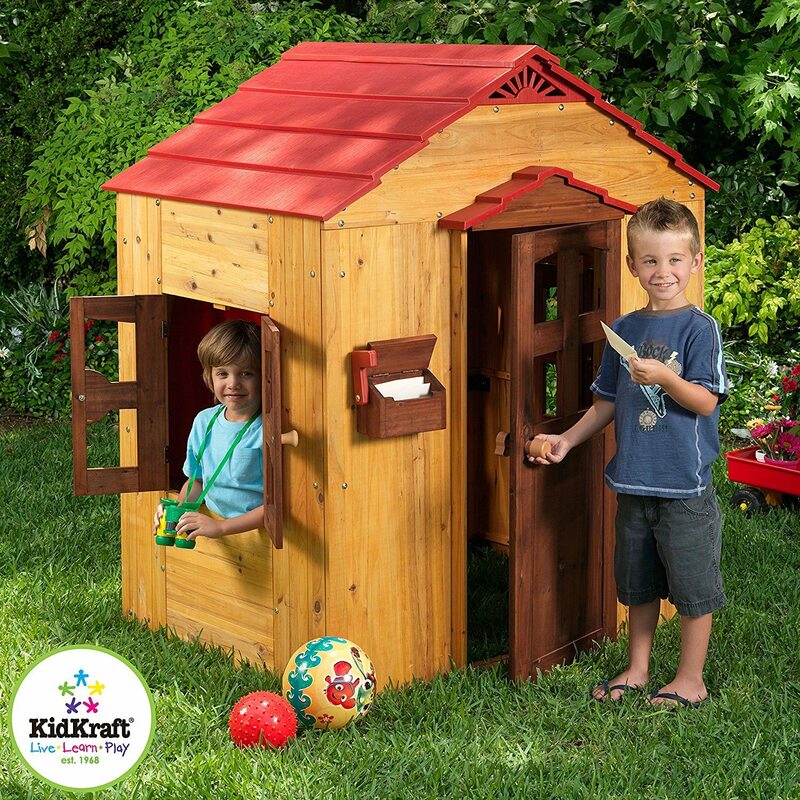 Another affordable—yet durable—playhouse for your little ones, the KidKraft Outdoor Playhouse is made up of weather-resistant wood and features a mailbox, windows with shutters, curtains and a toy sink. It’s big enough for your kid and their friends and, most importantly, can be built in as little two hours. 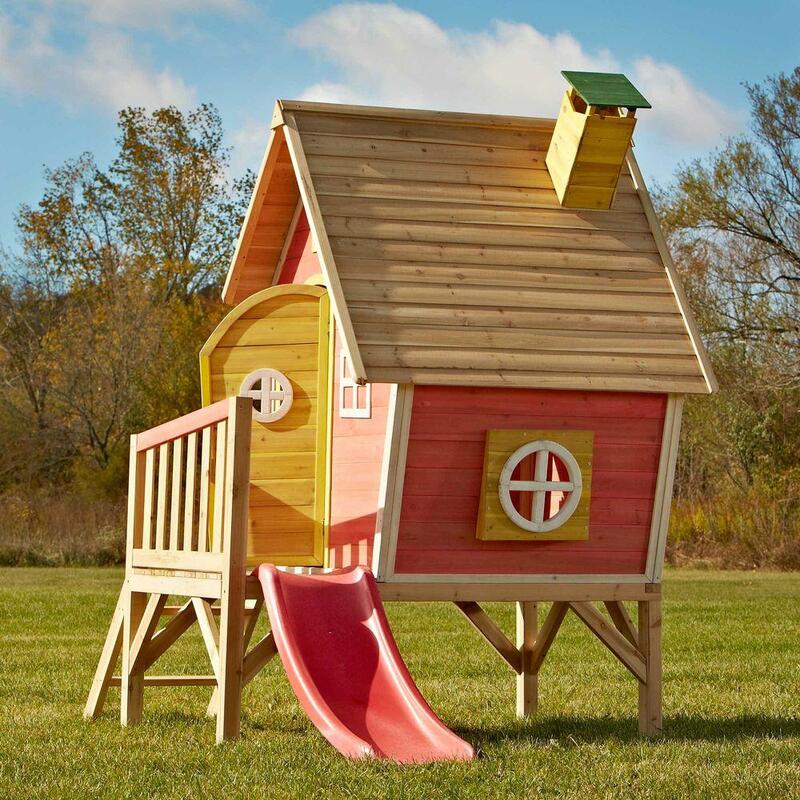 Complete with red design accents, this fun-sized playhouse costs $326.